To investigate possible mechanisms behind HIV-1 escape from CTL, we performed detailed longitudinal analysis of Gag (SLYNTVATL)- and RT (ILKEPVHGV)-specific CTL responses and plasma epitope sequences in five individuals. Among those with CTL against consensus epitope sequences, epitope mutations developed over several years, invariably followed by decay of the CTL targeting the consensus epitopes. The maturation state of the CTL varied among individuals and appeared to affect the rate of epitope mutation and CTL decay, despite similar IFN-γ production. Escape mutations were oligoclonal, suggesting fitness constraints. The timing of escape indicated that the net selective advantage of escape mutants was slight, further underscoring the importance of understanding factors determining selective pressure and viral fitness in vivo. Our data show surprisingly consistent decay of CTL responses after epitope escape mutation and provide insight into potential mechanisms for both immune failure and shifting CTL specificities. Class I-restricted CTL mediate an important immunological response to HIV-1 infection. The decline in plasma viral RNA after the appearance of HIV-specific CTL during acute infection (1, 2), the prognostic significance of vigorous CTL responses in disease progression (3, 4), and the striking increase in plasma SIV RNA in rhesus macaques depleted of CD8+ T cells (5, 6) are strong indications that CTL are critical in HIV-1 immunopathogenesis. Therefore, it follows that viral persistence and disease progression are due, at least in part, to the eventual failure of CTL. It is unclear why this host defense is inadequate to eliminate virus and prevent disease progression in most individuals. Clearly, a formidable challenge presented by HIV-1 is its ability to replicate continuously despite strong virus-specific responses. Among the many mechanisms postulated to explain CTL failure are sequence variation within or near their epitopes (7, 8, 9, 10, 11, 12), inefficient maturational state (13), and clonal exhaustion (14). However, comprehensive longitudinal in vivo data to illuminate these important issues in humans are scant (15, 16, 17, 18, 19). Understanding why CTL fail to eliminate HIV-1 is critical for understanding viral pathogenesis and developing effective therapeutic and vaccine strategies. To investigate the mechanisms behind HIV-1-specific CTL failure, we examined in vivo the longitudinal relationship between CTL and their corresponding epitope sequences in several individuals in the Multicenter AIDS Cohort Study (MACS) from whom samples were available from preseroconversion until late disease. We selected five men enrolled in the MACS (20) based on observed HIV-1 seroconversion, HLA A*0201 haplotype, and persistent viremia. 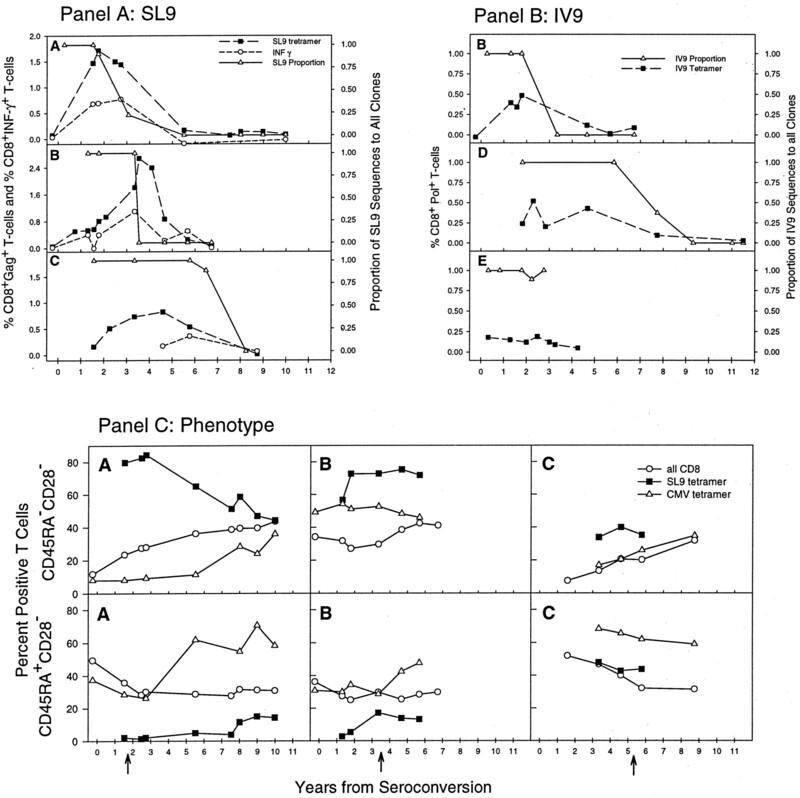 Ages ranged from 25 to 38 years at seroconversion, approximated at the midpoint of the 6-mo interval between the last seronegative, and first seropositive, visit. The participants received zidovudine monotherapy, or no treatment, during the study period. Plasma HIV-1 RNA levels were assessed by Amplicor (Roche Molecular Systems, Branchburg, NJ) or Quantiplex (Chiron, Emeryville, CA). All T cell and viral studies were performed on cryopreserved samples. All participants provided written informed consent. Peptides used in this study represented the HIV-1 p17 epitope SLYNTVATL (SL9), the HIV-1 RT epitope ILKEPVHGV (IV9), variants of SL9 (79F, 84V, 79F-84V, 82I-84V, 79H-84V) and the CMV p65-derived epitope NLVPMVATV (NV9). Peptides were synthesized on a Model 433A peptide synthesizer (Applied Biosystems, Foster City, CA). Peptide identity and purity were verified by matrix-assisted laser desorption ionization-mass spectrometry or electrical stimulation-mass spectrometry). SL9-, IV9-, and NV9-bound HLA-A*0201 allophycocyanin-labeled tetramers (SL9-A2 and IV9-A2) were synthesized and used as previously described (21, 22). mAbs were obtained from BD Biosciences (San Jose, CA) except for anti-CCR7 (BD PharMingen, San Diego, CA) and PE-labeled goat anti-mouse IgM (Caltag, Burlingame, CA). PBMC (5 × 105) were stained for 40 min at 4°C with tetramer-allophycocyanin/anti-CD8-PerCP/anti-CD45RA-FITC/anti-CD28-PE. Select samples were stained with tetramer-allophycocyanin/anti-CD8-PerCP/anti-CD45RA-FITC/anti-CCR7/goat anti-mouse-PE. From 2 to 10 × 104 CD8+ events were analyzed on a FACSCalibur using CellQuest (BD Biosciences). Light scatter gating was determined using a separate sample containing 1 μg/ml 7-amino-actinomycin D, and viability within the scatter gate was ≥98. CD8+ T cell phenotyping was accepted only when tetramer-positive cells represented >0.08% of CD8+ lymphocytes and comprised at least 80 events. Peptide-specific IFN-γ production was assayed by intracellular staining (23) after stimulation of PBMC with 1 μg/ml SL9 peptide or 10 μg/ml NV9 peptide and 1 μg/ml of brefeldin A (Golgi Plug; BD PharMingen). Positive controls used CD2/2R and CD28 Abs both at 10 μg/ml (BD Biosciences) (24). The cells were then stained with CD8-PerCP and CD3-allophycocyanin (BD Biosciences), permeabilized, stained with IFN-γ-PE or control Abs, and analyzed by FACSCalibur. CD8+ T cells were polyclonally expanded from PBMC of participant B as previously described (25) using a CD3:CD4 bispecific Ab (26) kindly provided by Dr. J. Wong. After 18 days of expansion, the cells were ∼90% CD8+ lymphocytes by flow cytometry. Standard ELISPOT for IFN-γ was performed as described (27). Cells were stimulated in duplicate with 20 μg/ml SL9 or variant peptides. Positive controls consisted of stimulation by anti-CD2/2R (10 μg/ml) and CD28 (20 μg/ml) Abs (BD Biosciences), and negative controls used medium alone. Peptide specific cells were quantified as spot-forming cells/106 cells using an ImmunoSpot Analyzer (Cellular Technology, Cleveland, OH). Plasma viral RNA was reverse-transcribed and amplified by endpoint dilution nested PCR with gag outer primers ATGGGTGCGAGAGCGTCA (nt 790–807) and CACTCTGCAGCTTCCTCATTGAT (nt 1424–1402), gag inner primers ACATTAAGTATGGGCAAGCAGGG (nt 885–903) and GGATGGCTCCTTCTGATAATGC (nt 1330–1309), pol outer primers TCAGAGCAGACCAGAGCCAAC (nt 2136–2156) and ACAGCTGGCTACTATTTCTTTTGCTACTA (nt 7388–7416), and pol inner primers CAACAGCCCCACCAGAAGAGA (nt 2153–2173) and GATCTGGTTGTGCTTGAATGATTC (nt 2528–2550). Positions are numbered according to HXB2 (28). After insertion in vector pGEM T by T-A cloning, DNA was sequenced (Prism 3100; Applied Biosystems). HMMER (http://hmmer.wustl.edu) was used to align nucleic acid sequences which were then edited using the multiple aligned sequence editor (29). Phylogenetic reconstructions were produced with maximum likelihood methods (30) using a general reversible model allowing rate variation (31); 390 positions in pol and 421 in gag fragment alignments were used to build trees. Basic local alignment search tool comparisons of experimental sequences to GenBank and neighbor-joining phylogenetic trees were used to screen the integrity of the obtained sequences (32). Validated viral sequences were submitted to GenBank (accession numbers pending). Five HLA-A*0201 men who seroconverted during observation in the MACS were screened for the HLA-A*0201-restricted consensus epitope sequences SL9 in p17 Gag (33) and IV9 in Po (34, 35). Their levels of viral RNA plasma and CD4+ T cell counts are shown (Fig. 1⇓). The three participants (A, B, and C) with initial plasma viral consensus SL9 sequences were chosen for longitudinal CTL evaluation with the SL9-A2 tetramer; the others (D and E) had nonconsensus SL9. Four participants (B, C, D, and E) initially demonstrated consensus IV9 sequences, three of whom had sufficient banked specimens to allow study with the IV9-A2 tetramer (B, D, and E). Clinical profile of study participants A through E. Absolute CD4+ T cell counts and plasma viremia are shown. To investigate the fate of HIV-1-specific CTL, we measured SL9 (participants A, B, and C)- and IV9 (participants B, D, and E)-specific CD8+ T cells from seroconversion until death or initiation of combination antiretroviral therapy (Fig. 2⇓). Participants A, B, and C demonstrated SL9-specific CD8+ T cells arising after infection, peaking, and then declining to undetectable levels. Peak frequencies were ∼1.7, 2.5, and 0.8% of total CD8+ T cells, respectively. 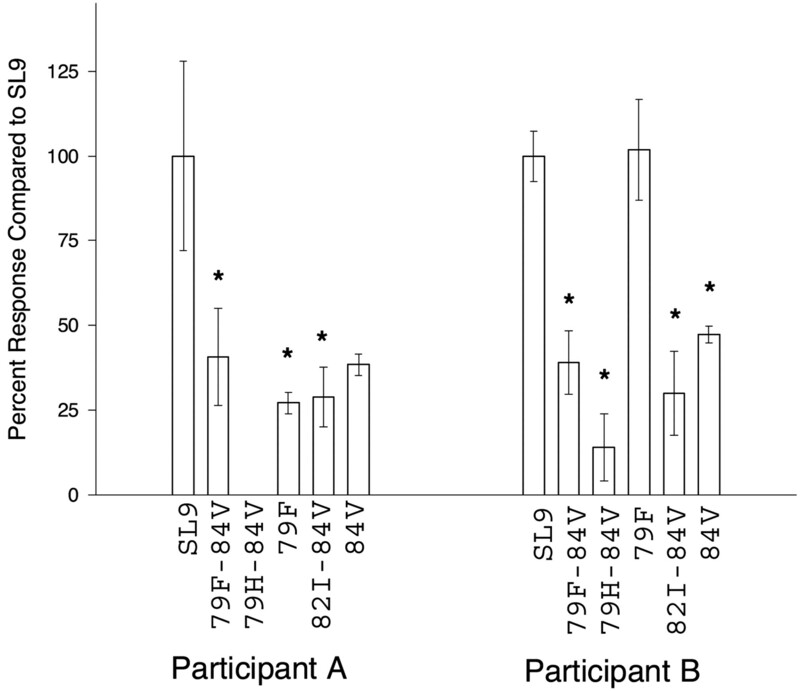 IV9-specific CD8+ T cells in participants B and D followed a similar pattern but peaked at ∼0.5%; participant E exhibited no IV9-specific CD8+ T cells. The decay of SL9- and IV9-specific responses was specific, given that percentages of CMV-specific CD8+ T cells rose over the same period (not shown). Our follow-up therefore revealed a surprisingly consistent pattern of HIV-1-specific CD8+ T cell decay over time. Longitudinal analysis of CD8+ T cells and epitope sequences. SL9 (A)- and IV9 (B)-specific CD8+ T cells in PBMC were detected by tetramer (▪) and peptide-induced IFN-γ (○). Plasma-derived SL9 was sequenced in parallel. ▵, Ratio of the consensus SL9 or IV9 sequence to variants. C, Percentages of CD45RA−CD28− and CD45RA+CD28− cells are shown for SL9- and NV9-specific CD8+ T cells and for total CD8+ T cells from participants A, B, and C. Arrows, Peak of the SL9-specific CD8+ T cell response in each participant. Letters within panels correspond to participants A through E.
We evaluated SL9-specific CD8+ T cells for maturational status and IFN-γ production as a correlate of cytolytic activity (36) (Fig. 2⇑). CD8+ T cells from participants A, B, and C displayed similar SL9-specific IFN-γ production; 30–60% of the CD8+ T cells produced detectable IFN-γ, suggesting these were indeed CTL, with the lowest percentage occurring at the peak of the SL9 response. In contrast, CD8+ T cells varied in their surface markers (Fig. 2⇑C). SL9-specific CD8+ T cells from participants A/B were predominantly CD45RA−CD28− throughout chronic infection, consistent with effector/preterminally differentiated CD8+ T cells (37). Additional analysis further identified the predominant phenotype as CD45RA−CD28−CD27+CCR7− (not shown). In contrast, the CD8+ T cells in participant C were ∼50% CD45RA+CD28−CCR7−, a terminally differentiated phenotype (13, 37). As previously observed (13, 38), CMV-specific CD8+ T cells (recognizing NV9) in participants A, B, and C were predominately terminally differentiated (CD45RA+CD28−; not shown). Overall, these data demonstrate that the differentiation state of HIV-1-specific CD8+ T cells can vary between individuals. To investigate the waning of SL9-specific CTL, we analyzed plasma RNA gag sequences (Fig. 2⇑ and Table I⇓). In participants A and B, consensus SL9 sequences dominated until the approximate peak of SL9-specific CTL 2–4 years postinfection. Thereafter, variants rapidly overgrew, with the decline of SL9-specific CTL lagging by 6–12 mo (Fig. 2⇑ and Table I⇓), suggesting that CTL loss resulted from epitope escape. In contrast, SL9 mutation in participant C, in whom the SL9-specific CTL response was approximately one-half that of A/B, occurred later (6–7 years postinfection), and the decline of the CTL response preceded epitope mutation. This suggested that loss of these CTL in participant C began independently of epitope mutation. As observed for SL9, mutation in the IV9 epitope in participants B and D also preceded loss of the IV9-specific CD8+ T cells (Fig. 2⇑ and Table II⇓). In participant B, IV9 variants emerged with approximately the same kinetics as SL9 variants despite the lower frequency of IV9-specific CD8+ T cells (Figs. 2⇑ and 3⇓). Participant D followed a similar pattern, with later kinetics. Consensus IV9 in participant E persisted unchanged in the absence of a detectable IV9-specific CD8+ T cell response. Although not all individuals mounted a CD8+ T cell response to IV9, our data demonstrate a pattern of epitope and CD8+ T cell loss similar to that of SL9. Maximum likelihood phylogenetic tree analysis of periepitope sequences. Phylogenetic reconstructions on the longitudinal sequence data from the SL9 (A) and IV9 epitopes (B) are shown. The epitope sequences are indicated to the right of each branch, and the numeric label for each of the taxa indicates the number of years from infection. Identical sequences from the same time point were deleted for clarity. Letters at the top of each column correspond to participants A through E.
The phylogenetic evolutionary relationships of sequences within and surrounding the gag and pol epitopes were assessed. Initial SL9 mutations in participants A, B, and C involved single substitutions with continued evolution to double mutations (Table I⇑ and Fig. 3⇑), indicating continued selection in vivo. This was possibly due to continued or shifting immunological pressures and/or a role for compensatory mutations to enhance replicative fitness of the escaped virus as reported for another epitope in Gag (16). The starting nonconsensus SL9 sequences in participants D and E exhibited few changes, but one interesting finding was the alteration of the SL9 variant to consensus SL9 in participant D. IV9 sequences evolved mutations in the two CTL responders (participants B and D) but not nonresponder (participant) E (Fig. 3⇑) which, in contrast to SL9, were mostly single mutations. Although we were unable to study the CTL response of participant A, it was interesting to note a transient emergence of consensus IV9 in the third year postinfection, followed by a return to variant IV9. The temporal relationship of epitope mutation and CTL decay suggested that the epitope mutants were poorly recognized. We therefore examined CTL recognition of SL9 variants, as measured by IFN-γ release, for participants A and B (Fig. 4⇓). We screened cells from participants A and B taken within 2.5 years of infection (when consensus SL9 sequences predominated in vivo) for responsiveness to several observed SL9 variants (Fig. 4⇓). Except for 79F, all of the variants (at 20 μg/ml) elicited <50% the response to consensus SL9 peptide, indicating that the SL9-specific CTL detected by tetramer recognized these variants poorly at best, because variant-specific CTL could contribute to the observed activity. We did not observe the 79F variant, well-recognized by participant B, among his in vivo sequences, whereas the 79F-84V variant was detected (Table I⇑), consistent with specific selective pressure in vivo. Taken together, our results strongly suggest that the epitope variants arising in vivo were recognized with diminished efficiency by the consensus SL9-specific CTL in the persons in whom they were observed and thus represented escape mutations. CTL recognition of epitope variants. PBMC from participant A, 2 years postinfection, and polyclonally expanded CD8+ T cells from participant B, 2.5 years postinfection, were tested in duplicate against SL9 and variant peptides by ELISPOT. Data are expressed as the percent response to each peptide relative to consensus SL9 peptide (which yielded 292 and 143 spot-forming units/106 CD8+ T cells for participants A and B, respectively). Bars and brackets, mean response of two wells; ∗, variants detected within plasma of the specified individual. 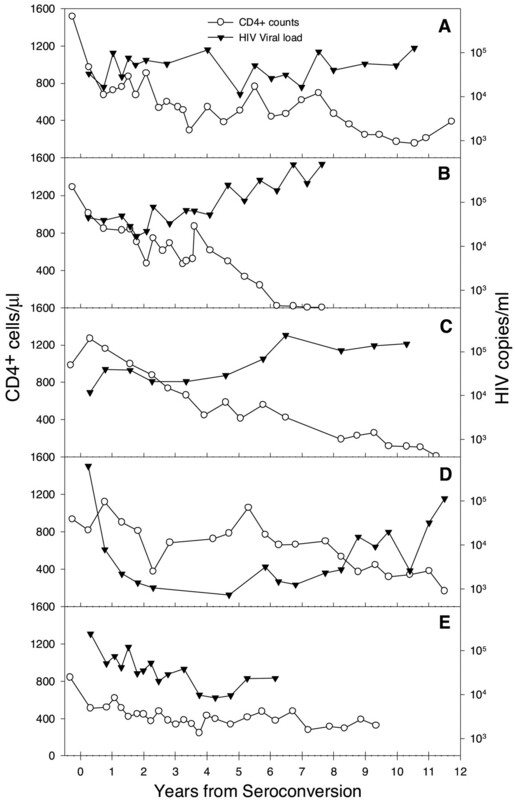 Cross-sectional evaluations of HIV-1 escape from CTL have yielded mixed findings (9, 10, 11, 39). Only a handful of studies have evaluated in vivo escape of HIV-1 from CTL longitudinally (15, 16, 17, 18, 19), and these have yielded more convincing evidence of escape. Perhaps the clearest data have been from the better controlled SIV-macaque model. These studies found that escape is strongly influenced by factors such as CTL specificity and possibly avidity (40, 41). Taken together with the mixed results of the other studies, it becomes clear that multiple factors must be involved in viral escape. Our results strongly support the hypothesis that HIV-1 can evade the CTL response through mutation. We document the longitudinal relationship of SL9- and IV9-specific CTL ontogeny, subsequent epitope variation, and eventual predominance of CTL-resistant mutations. Generally, an initial index epitope sequence elicits a CTL response, followed by poorly recognized epitope mutations, suggesting that the CTL exert selective pressure against the index epitope. Although our findings appear to contradict a comprehensive cross-sectional study of SL9 in vivo by Brander et al. (39), our data are compatible because those subjects may have been studied before late occurring escape. We found no evidence to suggest that SL9 epitope processing and presentation to CTL was altered in response to mutations outside of the epitope as the only change with any correlation to epitope escape, the lysine to arginine change at aa 76 (Table I⇑), was previously shown not to affect processing of this epitope (42). Rather SL9 epitope escape more likely involved both diminished CTL recognition and/or reduced class I binding. The variants 79F–84V and 82I–84V both bind HLA-A*0201 with an affinity similar to that of SL9 (39); therefore, the likely mechanism of escape for these variants is the loss of T cell recognition. In contrast, 79F and 84V have been shown to be diminished in their ability to bind HLA-A*0201 despite retention of the primary anchor sequences (39). Although Brander et al. (39) did not test 79H–84V in their study, histidine as the third amino acid of a 9-aa peptide has been reported to decrease binding to HLA-A2 (43). Taken together, these results suggest that 79H–84V, 79F, and 84V escape CTL recognition by loss of HLA-A*0201 binding. In the case of 79F, this is particularly interesting as participant B appeared to elicit a CTL response to 79F that was equal in magnitude to the CTL response to SL9 (Fig. 4⇑). Because effector/memory, but not naive, CD8+ T cells respond to peptide stimulation following the polyclonal expansion protocol used in this study (data not shown), this finding suggests that participant B may have elicited new CTL responses against 79F presented by another HLA molecule. The extent to which new CTL responses can be mounted to epitope variants is currently unknown and is critical to understanding the inability of CTL to eradicate HIV. Despite the multitude of potential epitope mutations ablating epitope presentation or CTL recognition (7), we found that escape was oligoclonal in vivo. This strongly suggests that fitness constraints limit the diversity of escape. For example, no SL9 mutations in the A*0201 binding motif anchors were observed by us or Brander et al., highlighting the importance of fitness considerations in CTL epitope mutation. The finding that SL9 and IV9 variation did not occur for several years is surprising but consistent with prior findings (15). Given that every potential point mutation is generated 104–105 times per day in vivo (44), this indicates that the overall advantage of the escape mutations is very slight. Coffin (44) proposed that a variant with a 1% net fitness advantage would overgrow the population within 1000 replicative cycles. Indeed, this model (45) predicts that nonconsensus SL9 mutants as a whole carried net fitness advantages of only 0.2–0.6% in participants A, B, and C, assuming a generation time of 1.5 days with a uniform mutation rate of 10−4 (O. O. Yang, unpublished observation). Because the net fitness advantage includes the contributions of CTL pressure against the index and mutant epitopes and the fitness costs of epitope mutations, it is unclear to what extent slow escape is explained by high fitness costs vs low selective pressure. Our data indicate that CTL differentiation and maturation may influence selective pressure. At least four CTL differentiation stages have been proposed as defined by expression patterns of CD45RA, CD28, CD27, and CCR7 (13, 37, 38). In contrast to previous reports that HIV-1-specific CTL are CD45RA− (13, 38), we found differing phenotypes between individuals. SL9-specific CTL in participant C (but not A or B) were mostly terminally differentiated (CD45RA+CD28−CCR7−). These cells are limited in their proliferative capacity (13, 37), which may have contributed to the decreased frequency of CTL and relative delay of escape in this participant. We found an inverse correlation between the percentage of CD45RA−/CD28− CTL and the time to onset of SL9 mutation (not shown); however, further study is required to confirm this trend. Unexpectedly, we found a consistent decay in CTL responses after escape. Although some precedence exists (16), this is an uncommon finding. The long duration of follow-up here may have uncovered this otherwise rarely observed trend. Although the generality remains unknown, this process could link the observations that CTL in early HIV-1 and SIV infection rapidly induce escape mutations (17, 18, 41) and that the specificity of CTL responses shifts between acute and chronic HIV-1 infection (46). The escape mutations persisted after the decline of CTL, indicating that their net fitness benefit continued to be positive, raising questions about persisting CTL pressure in tissues, opposing CTL pressures against the variants, or fitness compensation in the mutants. Participant D displayed a shift from nonconsensus to consensus SL9 over the course of infection, suggesting selection by a combination of immune pressure on the nonconsensus index sequence and replicative fitness considerations. We were, however, unable to correlate the emergence of epitope variants with changes in the levels of plasma viral RNA in our participants, possibly due to the small sample size. In summary, our results strongly support epitope variation in HIV-1 as a means by which the virus escapes CTL even in chronic infection. The relative contributions of CTL pressure and viral fitness considerations remain to be elucidated, but our data indicate that the net balance can be slight and influenced by factors such as CTL phenotype. A better understanding of the interaction of HIV-1 with CTL in immunopathogenesis will hopefully provide critical insight for vaccine and immunotherapeutic approaches. We thank Dr. Christel Uittenbogaart for critical review of the manuscript and Dr. Ka-Leung Ngai and the Great Lakes Regional CFAR (Feinberg School of Medicine, Northwestern University) for synthesis of the peptides. Data in this article were collected by the MACS with centers (Principal Investigators) at The Johns Hopkins Bloomberg School of Public Health (Dr. Joseph Margolick, Dr. Alvaro Muñoz), Howard Brown Health Center, and Northwestern University Medical School (Dr. John Phair), University of California, Los Angeles (Dr. Roger Detels, Dr. Beth Jamieson), and University of Pittsburgh (Dr. Charles Rinaldo). ↵1 This work was supported by National Institute of Allergy and Infectious Diseases National Institutes of Health Grants AI-37613, AI-35040 (to B.D.J. ), and AI-43203 (to O.O.Y.). Flow cytometry was supported by National Institutes of Health Grants CA-16042 and AI-28697 as well as support from the UCLA Jonnson Comprehensive Cancer Center, AIDS Institute, and Geffen School of Medicine to the flow cytometry core facility. The MACS is funded by the National Institute of Allergy and Infectious Diseases, with additional supplemental funding from the National Cancer Institute (Grants UO1-AI-35042, 5-M01-RR-00052 (General Clinical Research Centers), UO1-AI-35043, UO1-AI-37984, UO1-AI-35039, UO1-AI-35040, UO1-AI-37613, and UO1-AI-35041). ↵3 Deceased May 30, 2000. Koup, R. A.. 1994. Virus escape from CTL recognition. J. Exp. Med. 180:779. Borrow, P., H. Lewicki, B. H. Hahn, G. M. Shaw, M. B. A. Oldstone. 1994. Virus-specific CD8+ cytotoxic T-lymphocyte activity associated with control of viremia in primary human immunodeficiency virus type 1 infection. J. Virol. 68:6103. Carmichael, A., X. Jin, P. Sissons, L. Borysiewicz. 1993. Quantitative analysis of the human immunodeficiency virus type 1 (HIV-1)-specific cytotoxic T lymphocyte (CTL) response at different stages of HIV-1 infection: differential CTL responses to HIV-1 and Epstein-Barr virus in late disease. J. Exp. Med. 177:249. Connor, R. I., H. Mohri, Y. Cao, D. D. Ho. 1993. Increased viral burden and cytopathicity correlate temporally with CD4+ T-lymphocyte decline and clinical progression in human immunodeficiency virus type 1-infected individuals. J. Virol. 67:1772. Schmitz, J. E., M. J. Kuroda, S. Santra, V. G. Sasseville, M. A. Simon, M. A. Lifton, P. Racz, K. Tenner-Rácz, M. Dalesandro, B. J. Scallon, et al 1999. Control of viremia in simian immunodeficiency virus infection by CD8+ lymphocytes. Science 283:857. Jin, X., D. E. Bauer, S. E. Tuttleton, S. Lewin, A. Gettie, J. Blanchard, C. E. Irwin, J. T. Safrit, J. Mittler, L. Weinberger, et al 1999. Dramatic rise in plasma viremia after CD8+ T cell depletion in simian immunodeficiency virus-infected macaques. J. Exp. Med. 189:991. McMichael, A.. 1998. T cell responses and viral escape. Cell 93:673. Pircher, H., D. Moskophidis, U. Rohrer, K. Burki, H. Hengartner, R. M. Zinkernagel. 1990. Viral escape by selection of cytotoxic T cell-resistant virus variants in vivo. Nature 346:629. Couillin, I., B. Culmann-Penciolelli, E. Gomard, J. Choppin, J. Levy, J. Guillet, S. Saragosti. 1994. Impaired cytotoxic T lymphocyte recognition due to genetic variations in the main immunogenic region of the human immunodeficiency virus 1 nef protein. J. Exp. Med. 180:1129. Phillips, R. E., S. Rowland-Jones, D. F. Nixon, F. M. Gotch, J. P. Edwards, A. O. Ogunlesi, J. G. Elvin, J. A. Rothbard, C. R. M. Bangham, C. R. Rizza, A. J. McMichael. 1991. Human immunodeficiency virus genetic variation that can escape cytotoxic T cell recognition. Nature 354:453. Meyerhans, A., G. Dadaglio, J.-P. Vartanian, P. Langlade-Demoyen, R. Frank, B. Åsjö, F. Plata, S. Wain-Hobson. 1991. In vivo persistence of a HIV-1-encoded HLA-B27-restricted cytotoxic T lymphocyte epitope despite specific in vitro reactivity. Eur. J. Immunol. 21:2637. Dai, L., K. West, R. Littaua, K. Takahashi, F. Ennis. 1992. Mutation of human immunodeficiency virus type 1 at amino acid 585 on gp41 results in loss of killing by CD8+ A24-restricted cytolytic T lymphocytes. J. Virol. 66:3151. Champagne, P., G. S. Ogg, A. S. King, C. Knabenhans, K. Ellefsen, M. Nobile, V. Appay, G. P. Rizzardi, S. Fleury, M. Lipp, R. Forster, S. Rowland-Jones, R. P. Sekaly, A. J. McMichael, G. Pantaleo. 2001. Skewed maturation of memory HIV-specific CD8 T lymphocytes. Nature 410:106. Gotch, F. M., D. F. Nixon, N. Alp, A. J. McMichael, L. K. Borysiewicz. 1990. High frequency of memory and effector gag specific cytotoxic T lymphocytes in HIV seropositive individuals. Int. Immunol. 2:707. Goulder, P. J. R., R. E. Phillips, R. A. Colbert, S. McAdam, G. Ogg, M. A. Nowak, P. Giangrande, G. Luzzi, B. Morgan, A. Edwards, A. J. McMichael, S. Rowland-Jones. 1997. Late escape from an immunodomainant cytotoxic T-lymphocyte response associated with progression to AIDS. Nat. Med. 3:212. Kelleher, A. D., C. Long, E. C. Holmes, R. L. Allen, J. Wilson, C. Conlon, C. Workman, S. Shaunak, K. Olson, P. Goulder, et al 2001. Clustered mutations in HIV-1 gag are consistently required for escape from HLA-B27-restricted cytotoxic T lymphocyte responses. J. Exp. Med. 193:375. Price, D. A., P. J. R. Goulder, P. Klenerman, A. K. Sewell, P. J. Easterbrook, M. Troop, C. M. Bangham, R. E. Phillips. 1997. Positive selection of HIV-1 cytotoxic T lymphocyte escape variants during primary infection. Proc. Natl. Acad. Sci. USA 94:1890. Borrow, P., H. Lewicki, X. Wei, M. S. Horwitz, N. Peffer, H. Meyers, J. A. Nelson, J. E. Gairin, B. H. Hahn, M. B. A Oldstone, G. M. Shaw. 1997. Antiviral pressure exerted by HIV-1-specific cytotoxic T lymphocytes (CTLs) during primary infection demonstrated by rapid selection of CTL escape virus. Nat. Med. 3:205. Koenig, S., A. J. Conley, Y. A. Brewah, G. M. Jones, S. Leath, L. J. Boots, V. Davey, G. Pantaleo, J. F. Demarest, C. Carter, et al 1995. Transfer of HIV-1-specific cytotoxic T lymphocytes to an AIDS patient leads to selection for mutant HIV variants and subsequent disease progression. Nat. Med. 1:330. Kaslow, R. A., D. G. Ostrow, R. Detels, J. P. Phair, B. F. Polk, C. R. Rinaldo, Jr. 1987. The Multicenter AIDS Cohort Study: rationale, organization, and selected characteristics of the participants. Am. J. Epidemiol. 126:310. Altman, J. D., P. A. H. Moss, P. J. R. Goulder, D. H. Barouch, M. G. McHeyzer-Williams, J. I. Bell, A. J. McMichael, M. M. Davis. 1996. Phenotypic analysis of antigen-specific T lymphocytes. Science 274:94. Ogg, G. S., X. Jin, S. Bonhoeffer, P. R. Dunbar, M. A. Nowak, S. Monard, J. P. Segal, Y. Cao, S. L. Rowland-Jones, V. Cerundolo, et al 1998. Quantitation of HIV-1-specific cytotoxic T lymphocytes and plasma load of viral RNA. Science 279:2103. Maino, V. C., M. A. Suni, J. J. Ruitenberg. 1995. Rapid flow cytometric method for measuring lymphocyte subset activation. Cytometry 20:127. Riley, J. L., R. G. Carroll, B. L. Levine, W. Bernstein, D. C. St. Louis, O. S. Weislow, C. H. June. 1997. Intrinsic resistance to T cell infection with HIV type 1 induced by CD28 costimulation. J. Immunol. 158:5545. Yang, O. O., S. A. Kalams, A. Trocha, H. Cao, A. Luster, R. P. Johnson, B. D. Walker. 1997. Suppression of human immunodeficiency virus type 1 replication by CD8+ cells: evidence for HLA class I-restricted triggering of cytolytic and non-cytolytic mechanisms. J. Virol. 71:3120. Wong, J. T., R. B. Colvin. 1987. Bi-specific monoclonal antibodies: selective binding and complement fixation to cells that express two different surface antigens. J. Immunol. 139:1369. Tary-Lehmann, M., D. E. Hricik, A. C. Justice, N. S. Potter, P. S. Heeger. 1998. Enzyme-linked immunosorbent assay spot detection of interferon-γ and interleukin 5-producing cells as a predictive marker for renal allograft failure. Transplantation 66:219. Myers, G., B. T. Korber, B. T. Foley, K.-T. Jeang, J. W. Mellors, S. Wain-Hobson. 1996. Human Retroviruses and AIDS 1996: A Compilation and Analysis of Nucleic Acid and Amino Acid Sequences Theoretical Biology and Biophysics Group, Los Alamos National Laboratory, Los Alamos, NM. Faulkner, D. V., J. Jurka. 1988. Multiple aligned sequence editor (MASE). Trends Biochem. Sci. 13:321. Olsen, G. J., H. Matsuda, R. Hagstrom, R. Overbeek. 1994. fastDNAmL: a tool for construction of phylogenetic trees of DNA sequences using maximum likelihood. Comput. Appl. Biosci. 10:41. Korber, B., M. Muldoon, J. Theiler, F. Gao, R. Gupta, A. Lapedes, B. H. Hahn, S. Wolinsky, T. Bhattacharya. 2000. Timing the ancestor of the HIV-1 pandemic strains. Science 288:1789. Kuiken, C. L., B. Korber. 1998. Sequence quality control. B. Korber, Jr, and C. L. Kuiken, Jr, and B. Foley, Jr, and B. Hahn, Jr, and F. McCutchan, Jr, and J. W. Mellors, Jr, and J. Sodroski, Jr, eds. Human Retroviruses and AIDS 1998: A Compilation and Analysis of Nucleic Acid and Amino Acid Sequences 80. Theoretical Biology and Biophysics Group, Los Alamos National Laboratory, Los Alamos, NM. Johnson, R. P., A. Trocha, L. Yang, G. P. Mazzara, D. L. Panicali, T. M. Buchanan, B. D. Walker. 1991. HIV-1 gag-specific cytotoxic T lymphocytes recognize multiple highly conserved epitopes: fine specificity of the gag-specific response defined by using unstimulated peripheral blood mononuclear cells and cloned effector cells. J. Immunol. 147:1512. Tsomides, T. J., B. D. Walker, H. N. Eisen. 1991. An optimal viral peptide recognized by CD8+ T cells binds very tightly to the restricting class I major histocompatibility complex protein on intact cells but not to the purified class I protein. Proc. Natl. Acad. Sci. USA 88:11276. Tsomides, T. J., A. Aldovini, R. P. Johnson, B. D. Walker, R. A. Young, H. N. Eisen. 1994. Naturally processed viral peptides recognized by cytotoxic T lymphocytes on cells chronically infected by human immunodeficiency virus type 1. J. Exp. Med. 180:1283. Altfeld, M. A., A. Trocha, R. L. Eldridge, E. S. Rosenberg, M. N. Phillips, M. M. Addo, R. P. Sekaly, S. A. Kalams, S. A. Burchett, K. McIntosh, B. D. Walker, P. J. R. Goulder. 2000. Identification of dominant optimal HLA-B60- and HLA-B61-restricted cytotoxic T-lymphocyte (CTL) epitopes: rapid characterization of ctl responses by enzyme-linked immunospot assay. J. Virol. 74:8541. Hamann, D., P. A. Baars, M. H. G. Rep, B. Hooibrink, S. R. Kerkhof-Garde, M. R. Klein, R. A. W. Van Lier. 1997. Phenotypic and functional separation of memory and effector human CD8+ T cells. J. Exp. Med. 186:1407. Appay, V., P. R. Dunbar, M. Callan, P. Klenerman, G. M. Gillespie, L. Papagno, G. S. Ogg, A. King, F. Lechner, C. A. Spina, et al 2002. Memory CD8+ T cells vary in differentiation phenotype in different persistent virus infections. Nat. Med. 8:379. Brander, C., K. E. Hartman, A. K. Trocha, N. G. Jones, R. P. Johnson, B. Korber, P. Wentworth, S. P. Buchbinder, S. Wolinsky, B. D. Walker, S. A. Kalams. 1998. Lack of strong immune selection pressure by the immunodominant, HLA-A*0201-restricted cytotoxic T lymphocyte response in chronic human immunodeficiency virus-1 infection. J. Clin. Invest. 101:2559. Allen, T. M., D. H. O’Connor, P. Jing, J. L. Dzuris, B. R. Mothé, T. U. Vogel, E. Dunphy, M. E. Liebl, C. Emerson, N. Wilson, et al 2000. Tat-specfic cytotoxic T lymphocytes select for SIV escape variants during resolution of primary viraemia. Nature 407:386. O’Connor, D. H., T. M. Allen, T. U. Vogel, P. Jing, I. P. DeSouza, E. Dodds, E. J. Dunphy, C. Melsaether, B. Mothe, H. Yamamoto, et al 2002. Acute phase cytotoxic T lymphocyte escape is a hallmark of simian immunodeficiency virus infection. Nat. Med. 8:493. Brander, C., O. O. Yang, N. G. Jones, Y. Lee, P. Goulder, R. P. Johnson, A. Trocha, D. Colbert, C. Hay, S. Buchbinder, et al 1999. Efficient processing of the immunodominant, HLA-A*0201-restricted human immunodeficiency virus type 1 cytotoxic T-lymphocyte epitope despite multiple variations in the epitope flanking sequences. J. Virol. 73:10191. Ruppert, J., J. Sidney, E. Celis, R. T. Kubo, H. M. Grey, A. Sette. 1993. Prominent role of secondary anchor residues in peptide binding to HLA-A2.1 molecules. Cell 74:929. Coffin, J. M.. 1995. HIV population dynamics in vivo: implications for genetic variation, pathogenesis, and therapy. Science 267:483. Rouzine, I. M., A. Rodrigo, J. M. Coffin. 2001. Transition between stochastic evolution and deterministic evolution in the presence of selection: general theory and application to virology. Microbiol. Mol. Biol. Rev. 65:151. Goulder, P. J. R., M. A. Altfeld, E. S. Rosenberg, T. Nguyen, Y. Tang, R. L. Eldridge, M. M. Addo, S. He, J. S. Muckerjee, M. N. Phillips, et al 2001. Substantial differences in specificity of HIV-specific cytotoxic T cells in acute and chronic HIV infection. J. Exp. Med. 193:181.